← Foreclosures Make Us Sick! 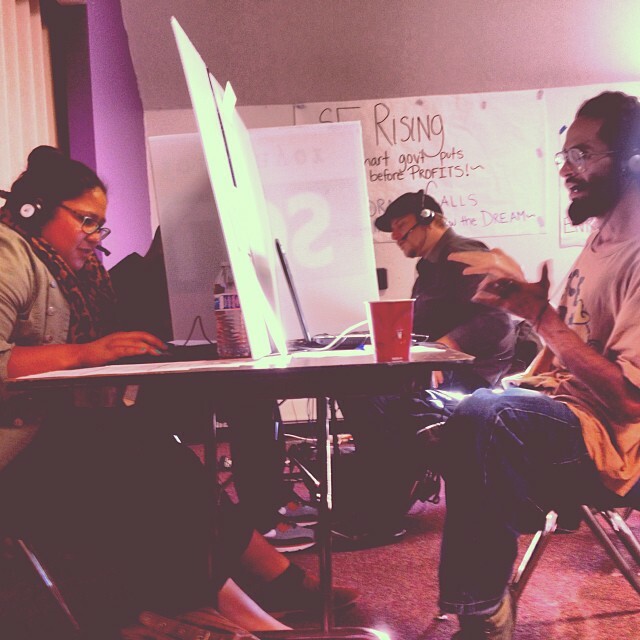 From October 14 through November 3, 2013, San Francisco Rising, in partnership with our statewide progressive tax and fiscal policy reform alliance California Calls, conducted a civic engagement program (CEP). Employing both traditional door-to-door canvassing and a high-volume predictive dialer system that enables hundreds of calls per hour, we contacted over 4,600 voters in targeted precincts largely on the eastside of San Francisco. As with all such outreach programs – being an anchor organization of California Calls, we conduct multiple such programs each year – the purpose of this CEP was twofold. On the one hand, CEP’s advance our goal of long-term progressive tax and fiscal policy reform by enabling us to expand and educate the electorate, repeatedly contacting new and occasional voters about the importance of tax and fiscal policy reform and our progressive vision of government. Secondly, CEP’s are an opportunity to activate and mobilize voters on important topical issues (last year, notably, SF Rising and California Calls’ field operation were critical to the passage of the tax measure Proposition 30). This year, our statewide topical focus was educating voters about the Affordable Care Act. While far from the kind of single-payer system SF Rising believes is ideal for providing people with access to health care, the Affordable Care Act is nonetheless a momentous expansion of healthcare access and a meaningful achievement in increasing government’s regulatory role in the provision of healthcare, which SF Rising believes is human right. All told, we contacted 4,632 voters, found that 3,822 of those voters support the Affordable Care Act, and got commitments from 3,764 of those voters to support statewide tax and fiscal policy reform on the June and November 2014 ballots. In addition to educating people about the Affordable Care Act and our vision for statewide progressive tax and fiscal policy reform, SF Rising deployed 2 local questions to further our municipal policy work. More widely, we found that 3,038 voters agreed that San Francisco businesses should continue to pay the employer spending requirement to ensure that Healthy San Francisco remains able to provide basic healthcare services to all – regardless of immigration status or income. For some months now, powerful members of the San Francisco business community like the Golden Gate Restaurant Association which never wanted Healthy San Francisco to exist and sued to stop the City’s implementation of the have been pressuring City Hall to strip businesses of their requirement to help subsidize their employees healthcare costs. These are the same forces that never wanted Healthy San Francisco to exist in the first place, and unsuccessfully sued our City all the way to the Supreme Court to stop implementation of the employer spending mandate. Their new argument is that the employer spending mandate is in conflict with provisions of the Affordable Care Act. This will effectively gut the Healthy San Francisco program of its fiscal lifeblood, and destroy our vaunted system of universal healthcare. But the truth is that some 50,000 San Franciscans – including 20,000 members of our undocumented community – will remain uninsured even after the Affordable Care Act is fully implemented, according to the City’s Department of Public Health. This is why San Francisco Rising stands with the 3,038 voters we spoke with last month and has a single message for our local policy makers: Keep Healthy San Francisco strong and keep the employer spending mandate in place in order to ensure that our city continues to provide healthcare for all! This November 1st article from the San Francisco Chronicle that has great pictures of our canvassers. This entry was posted in Activities, Civic Engagement Programs, News, Uncategorized. Bookmark the permalink.